Regal Cinemas has just announced that they'll be serving Cheetos Popcorn, featuring Cheetos flavored popcorn along with actual Cheetos mixed in. According to the release, it'll be sold in 32oz. cups at Regal Cinemas beginning this Friday, December 15th, which is just in time to watch Star Wars: The Last Jedi with a ton of Cheetos dust stuck to your fingers. Between the tears from the movie and licking your fingers, the dust should be washed away during the 150-minute sci-fi adventure. "Cheetos Popcorn is our gift to Regal fans enjoying their favorite movie this holiday season," John Curry, of Regal Cinemas said and what a treat it is. 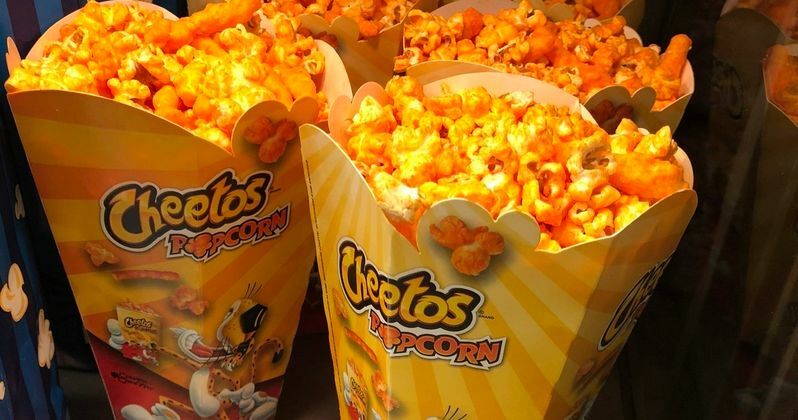 Cheetos have been making their way into all kinds of food lately and the Regal Cinema popcorn is just the latest in a culture of cuisine mashups. We've seen the Doritos tacos at Taco Bell and now there's the Mac N' Cheetos and Burger King's Chicken Cheetos Fries, so the popcorn infusion was really just a matter of time. According to Modi, PepsiCo's partnership with Regal Cinemas is part of the company's push to link its brands with experiences, such as going to the movies as opposed to just eating these concoctions at 3 AM all by yourself. A 2016 survey conducted by Market research firm Harris revealed that Millennials are over 75% more likely to spend money on experiences rather than physical products. As it turns out, experience-driven branding isn't a new space for PepsiCo. This summer, the company launched a Cheetos pop-up restaurant in New York City, where food nerds could taste Cheetos-covered and infused dishes prepared by celebrity master chef Anne Burrell. The response was incredibly well-received and there are plans to do another pop-up Cheetos restaurant in another location. Cheetos are the latest craze and it's going to be an experience. Regal Cinemas is the first national cinema chain to offer Cheetos Popcorn and Frito-Lay (who is owned by PepsiCo) director of marketing, Sean Mathews, announced his enthusiasm for the team up. Mathews claims that Cheetos and popcorn are the "ultimate movie snack combination." Sean Mathews detailed his excitement in a written statement, which you can read below. "We're excited to give moviegoers a chance to experience Cheetos in an unexpected and delicious new way through our first national theater partnership. Cheetos and popcorn are the ultimate movie snack combination, and Regal Cinemas is the perfect partner to launch Cheetos Popcorn nationally." The dangerously cheesy popcorn has been previously available at other Regal Cinemas, but the snack will now be available nationwide, allowing the United States to bask in the glory that is Cheetos Popcorn. In is not clear if they will be selling other versions of the popcorn with the Flaming Hot Cheetos, but that seems pretty much like a no brainer, since the Flaming Hot brand has taken off and extended to other brands of chips including Funyuns and Fritos. Head to Regal Cinemas to try this newest concoction this weekend and see how long it takes to wash the Cheetos dust off of your fingers in a dark movie theater. You can read more about the new partnership courtesy of Take Out.